Postcard view of the Auto Livery in Paxico, Kansas. 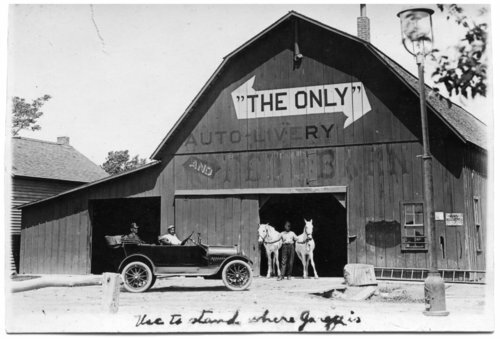 With the advent of automobiles in the 1910s, many of the livery stables converted to auto livery businesses which provided service to cars. On the reverse is written, "NW corner of intersection of Main Street and Topeka Avenue, City of Paxico. This building was moved and turned, now sits on back half of same lot. This photo is before 1919 when Rich Glotzbach purchased the lot and constructed a new block building on the site."